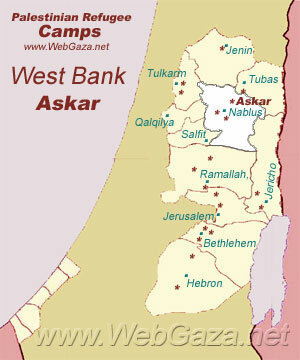 Askar Camp - Where is Askar Camp Located? Askar Camp, both Old and New Askar, has approximately 15,000 inhabitants. Like any refugee camp, Askar endures many hardships: substand living conditions, poverty, unemployment and inadequate education. 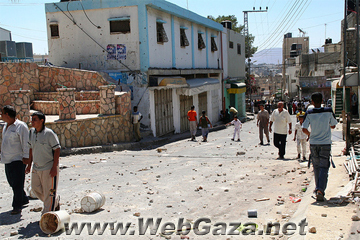 Askar camp was established in 1950 on 209 dunums of land within the municipal boundaries of Nablus. In 1964, the camp was expanded to cover an additional 90 dunums. Camp residents refer to this the additional area as "New Askar". The "New Askar" is not officially recognized as a camp, there are no UNRWA installations there, and the area falls within "zone B" (shared Israeli and Palestinian sovereignty). Old Askar camp falls under Palestinian Authority control in "zone A". Overcrowding in the camp is a serious issue and the camp committee has suggested expanding the camp's boundaries as a possible solution. However, UNRWA has no authority to carry out any expansion of camps since this comes under the jurisdiction of the host governments/authority.